Goodreads says, "Summer on the New Jersey shore offers Quinn a new start at life and love, but only if she can come to terms with her past. Graduation can't come soon enough. Desperate for a fresh start, Quinn is eager to escape to her aunt's house on the New Jersey shore for the summer…away from teenage drama and having to answer everyone's questions about "what comes next" after high school. Quinn can't bear to focus on the future. She doesn't even think she deserves one—not after her best friend died in a car accident that Quinn feels responsible for. But when Quinn meets Malcolm, a musician who has been trying to escape his own demons, she starts to believe in second chances." Quinn is dealing with a lot of guilt as her best friend died in a car accident that she feels responsible for. After a scandal at home involving a teacher, Quinn is spending the summer at the Jersey Shore at her aunt's house and working at the local bar. She is supposed to be figuring out what is next for her and come up with some sort of plan, but it's harder than it looks. She is definitely distracted by local musician, Malcom. He is the quintessential rocker and encourages her to play drums on his demo. Things progress to something more between the two of them, but she isn't sure this is the type of relationship is exactly healthy as Malcolm is very complicated and his past isn't squeaky clean to say the least. Can he help her move on from her past or will he complicate her life further? And ultimately this novel examines that big question for many seniors...what comes next? 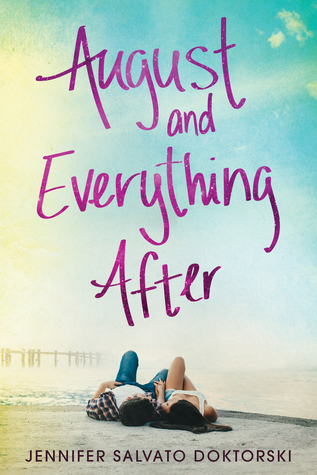 Jennifer Salvato Doktorski's August and Everything After is an edgier beach read for mature YA readers all set on the memorable backdrop of the Jersey Shore. I thought Quinn was an interesting character in August and Everything After. Her complex past is heartbreaking and I wanted to learn more about her. I really enjoyed her relationship with her aunt as well as Quinn's interest in music. Speaking of music, you can really tell that Doktorski knows music as well as bands. If you like this sort of thing, you will appreciate that the most about this book. The musical details, band life, demos, playing live in front of an audience, and the idea of going on tour is all explored in August and Everything After. One of the things that Doktorski does well is depict a summer at the Jersey Shore. You can tell she is well versed in shore life and really brought the small town, the bars, and the quirky people to life very well. I also appreciated that Malcolm and Quinn were dealing with grief regarding the untimely death of their friends. This made August and Everything After a more serious type of beach read. Quinn struggles with anxiety on a daily basis due to her complicated past and Malcolm struggles with addiction. So, obviously, this was a darker read than I anticipated despite the romance between Quinn and Malcolm. If you enjoy darker beach reads that tackle serious issues that teenagers face everyday, then you'll want to check out August and Everything After this summer, especially if you love all things music. While this isn't my favorite of Doktorski's novels, I still appreciated the novel's message. I love that this takes place at the Jersey Shore and that the author is really able to capture the setting. I can definitely relate to a main character not knowing what she wants to do after graduation. Yes, I think many teens can relate to Quinn for sure. I love that she went to the beach to figure things out...a perfect place to do so! Thanks for visiting, Angela! Among all things, I enjoy reading about a character who's knowledgable in music so looking forward to meeting Quinn. You'll love the focus on music in this book then! I hope you enjoy it, Joy! Thanks for dropping by!